Oh my goodness you guys. 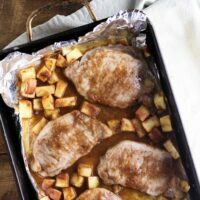 These Apple Pie Pork Chops have quickly become a new favorite in my household! They’ve got all of the sweetness and spices of your favorite apple pie combined with those savory pork chops. Apple and pork is one of my favorite combinations and this certainly does not disappoint. The apples get all tender and crunchy to pair perfectly with each bite of pork. 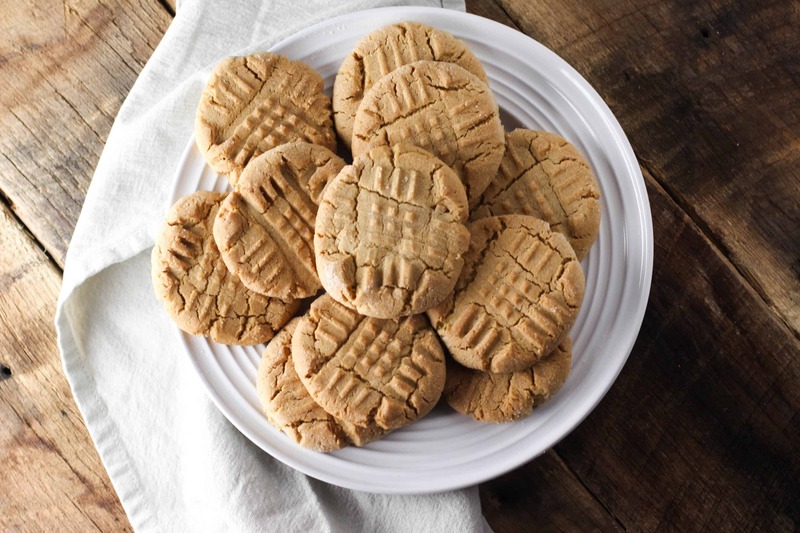 The combination of brown sugar, cinnamon, nutmeg, and paprika makes for this awesome flavor combination. The paprika helps cut through the sweetness and helps warm the flavors a little more. 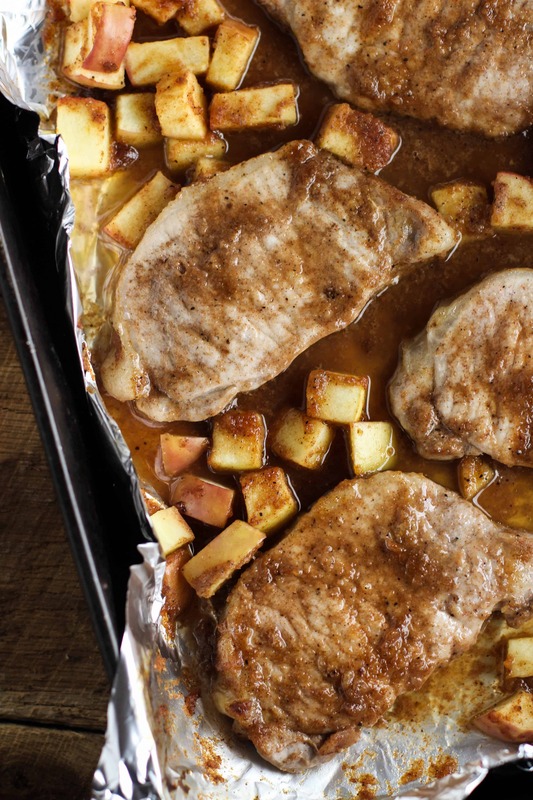 The apple sauce makes for a great base to help keep the pork chops tender as well! I make sure to thoroughly mix all of the spices and apple sauce together before spreading it over the pork chops and the apple pieces. 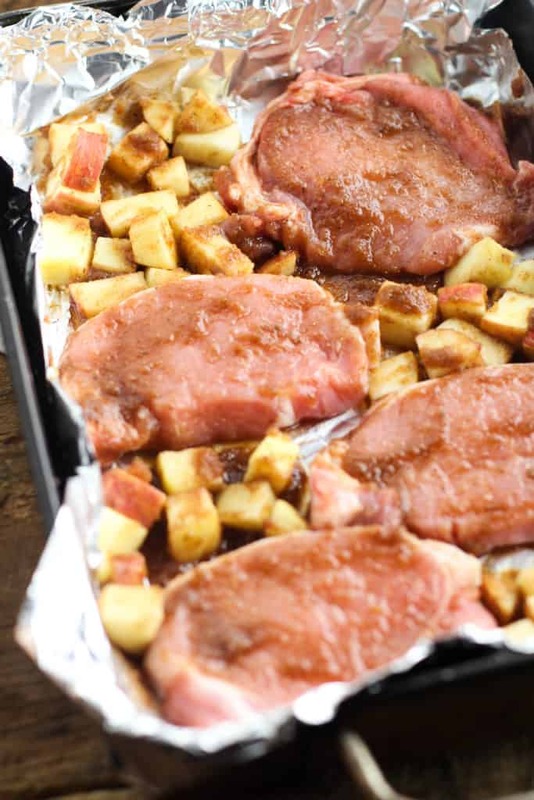 Be sure to get it on both sides of the pork chops so that the don’t stick to the foil or pan that you’re using! I’ve tried this with both bone-in and bone-out pork chops and the timing differs between the two. The bone-in pork chops take a little longer so just make sure you cook them until a thermometer placed in the thickest part of the pork chop reaches 165F. The thinner pork chops will definitely cook more quickly so after you flip them over keep an eye out. Depending on the thickness, I’ve had them cook through by 15-20 minutes. Nothing worse than a dry pork chop! The combination makes your house smell absolutely amazing and it is sooo simple to make. I quickly throw this together after work and it’s done in about 25 minutes. 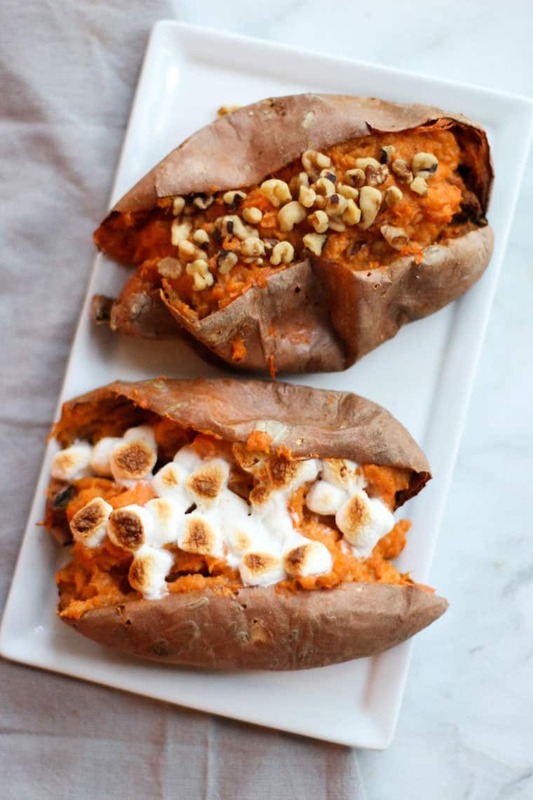 If you’re looking for some sides to pair with this, try these Creamy Garlic Mashed Potatoes, Twice Baked Sweet Potatoes, or Green Bean and Bacon Casserole! 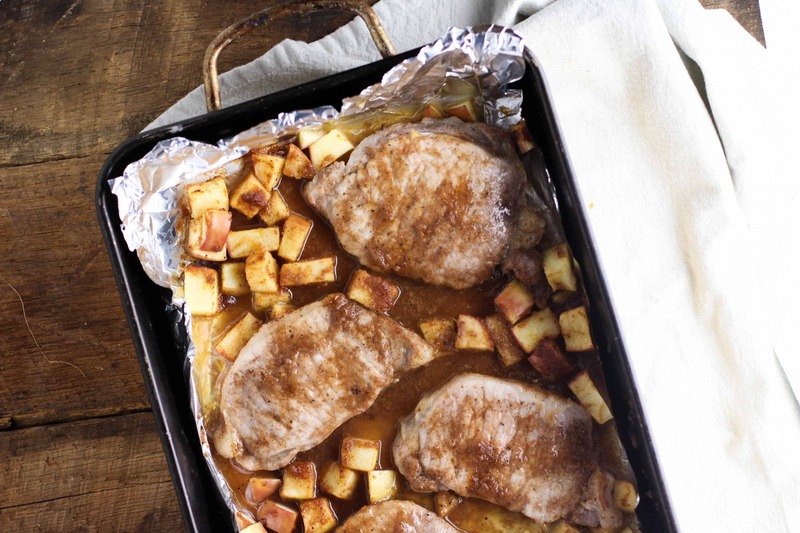 These Apple Pie Pork Chops are full of decadent dessert flavors, but are so easy to make! 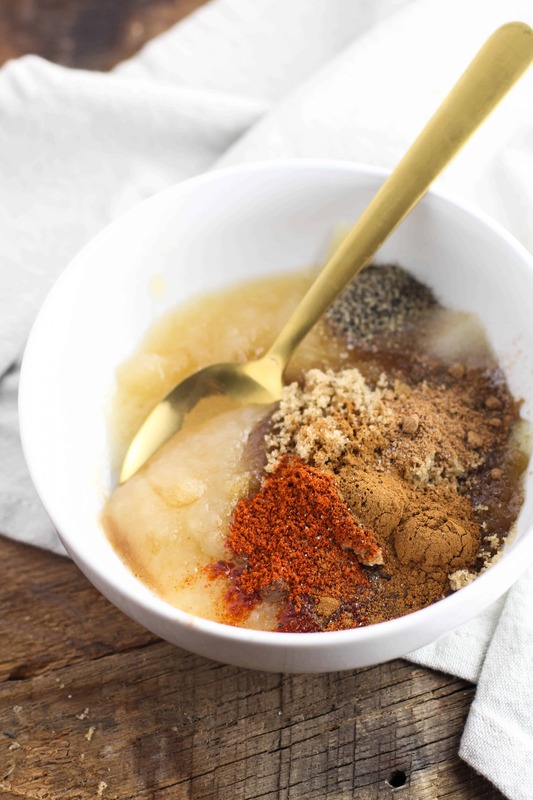 In a bowl, mix together apple sauce, brown sugar, paprika, cinnamon, nutmeg, salt, and pepper. Line a roasting pan with aluminum foil. Place apples and pork chops in. 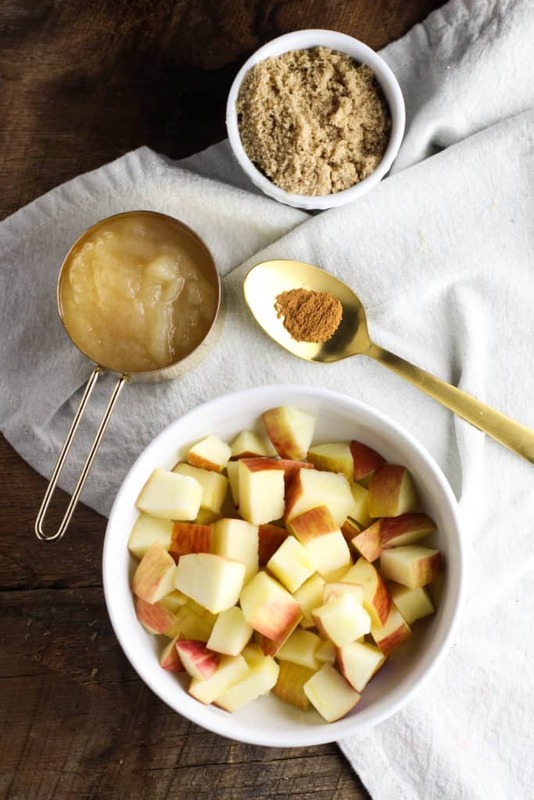 Drizzle apple sauce mixture over both sides of pork chops and on apples. Mix to make sure everything is coated evenly. Bake for 20 minutes flipping pork chops halfway through.